I’ve had these Sleek Barekissed Illuminators floating around my makeup box awaiting review for months now but have only just got round to opening them all for a closer look. I’ve used the Pompeii shade (bronze highlight shade) a few times (see my dewy skin look here) but haven’t tried the others before. Monaco is an Iridescent Pearl shade, Cuba is a Golden Peach, Casablanca is a Soft Champagne Pink, and Pompeii is a Honey Bronze shade. Ingredients: Aqua, Dimethicone, Isododecane, Glycerin, PEG-10 Dimethicone, Dimethicone / Vinyl Dimethicone Crosspolymer / Cyclopentasiloxan, PVP, Phenoxyethanol / Ethylhexylglycerin, Tocopheryl Acetate, Panthenol, Disodium EDTA, Parfum, Tin Oxide. May contain: CI 77019 ( Mica ) / CI 77891 ( Titanium Dioxide ), CI 77492 ( Iron Oxide Yellow ), CI 75470 ( Carmine ), CI 77891 ( Titanium Dioxide ), CI 77491 ( Iron Oxide Red ), CI 77499 ( Iron Oxide Black ). 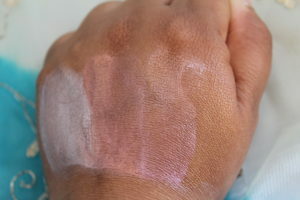 The product is quite a thick cream formula, as you can see from the image above. It is all too easy to apply too much. In the image below, I put one dot of each shade on the back of my hand. I used the smallest dot I could get out of the pump, so about half the size of the dots in the image above. The pump means more than you need is released and there’s not much you can do to avoid product wastage. When applying to your face, I would always advise using a small pallete or back of your hand, so you can control how much you put on the brush or on your fingers to apply to the top of cheekbones. 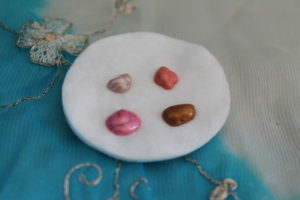 When blended lightly, the texture is paint-like, but when blended further (you have to work quick, before it sets), then it gives a better finish. I find this a bit too thick to wear on top of foundation, but will happily mix with a touch of foundation (silicone-based works best), or wear underneath foundation for a dewy look with an inner glow. The first ingredient after aqua is dimethicone, which indicates that this is a silicone based liquid highlighter. When mixing with foundation, it is best to mix with silicone-based foundation for a smoother finish. If applying on top of foundation, then be careful when wearing on top of a silicone-based foundation, as it will sit on top of it, rather than blending in, unless blended while wet. One of the key benefits of silicone is that it is long-lasting once set, and is also sweat-resistant. These take a bit of playing around with to get used to the texture and to find the best way to apply. I advise wearing underneath regular foundation for inner illumination, or by mixing with a touch of silicone-based foundation and applying to the high points of the face for best results. I will get a lot of use out of mine, as personal highlighters. I won’t be using in my kit though, as the glass bottles aren’t exactly pro-friendly, and also I prefer my Kryolan Shimmering Event Foundation in my kit for client use. If you’re looking for a long-lasting, liquid highlight, then one or two of these shades will suit you fine. 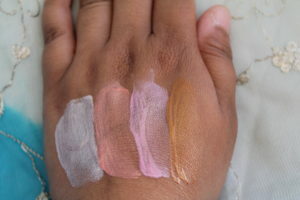 I suggest Monaco & Casabanca for cool skintones, or Pompeii & Cuba for warm skintones. Leave a reply on "Review: Sleek Barekissed Illuminators"